VSI Show-Me Animal Products is one of the most unique programs offered by this nonprofit organization. 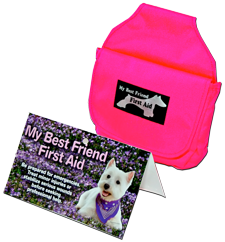 In part an economic development and job creation effort, Pet Care Products manufactures and markets first aid kits for pets and horses nationally. T he work allows VSI to create additional job opportunities that complement the traditional contract work undertaken by workshops. For more information, visit our Pet First Aid website (opens in new page). If you are interested in only equine products, visit our Vet First Aid website.